One of my overriding memories of my grandmother’s house was the pantry, a traditional long cupboard under the stairs accessed from the kitchen via several steps, and lined with shelves either side crammed with tins and packets and jars: it was cold! Nowadays homeowners predominantly have kitchens with wall-mounted cupboards, tall larders or drawer systems. But whatever design of kitchen you own, organisation is essential if you are to make efficient and effective use of space and to help to preserve foods for as long as possible. When embarking upon a pantry reorganisation, firstly completely empty your cupboards and sort through the contents carefully. You may be surprised just how old some of the items are! Dispose of out-of-date foods or items that you simply never use to avoid wasting precious space later. Give the cupboards a thorough clean with an antibacterial agent and group the remaining items by type (for example, herbs, sauces and flour). Dry foods, such as nuts, flour and pasta, often come in inconveniently shaped packets which split when opened and spill out into the cupboard. Due to the long life of these items they are better stored in plastic or glass sealed containers (transparent ones are better as you can see the contents without having to open them). Lids will also help to protect against infestations of flour mites. Remember to write the expiry date of the food on the container if possible or on a piece of paper which can be slipped inside. Small spice jars take up large amounts of space so a spice rack is a perfect way to store these containers efficiently. In this way the jars can be safely stacked and take up less room. You could place the spices you use most often at the front for easy reach or arrange them alphabetically if this is more convenient when cooking. Some kitchen items simply aren’t meant to be stacked such as icing pens, biscuit cutters, food colouring and so on. Whether you store these in a cupboard or drawer, you often find that these items are difficult to organise and quickly become untidy. Small baskets are perfect for storing these items in a systematic way. Loose items, such as cutters, can be grouped together and baskets – which are available in a range of sizes – are often pleasing on the eye too. 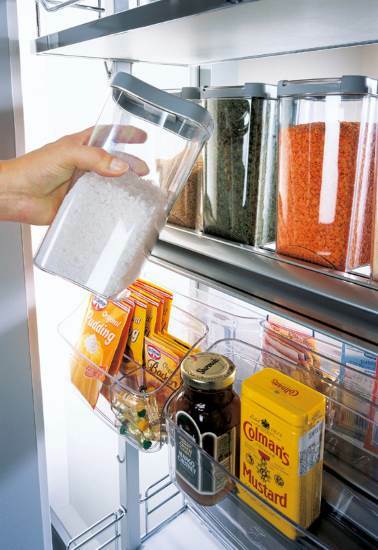 Reorganising your pantry is a cost-effective and quick way to achieving a kitchen that is more accessible, more user-friendly and more enjoyable!